Investors didn`t expect much from the housing market this time, but they were all surprised by the numbers coming out. They expected a 1,1% decline but new home sales soared 18,9% MoM last month. Wow. This is the biggest jump since January 1992. An annual rate of 667 000 in September of 2017 beats market expectations. It is the highest value since October of 2007 and the largest percentage gain since January of 1992. 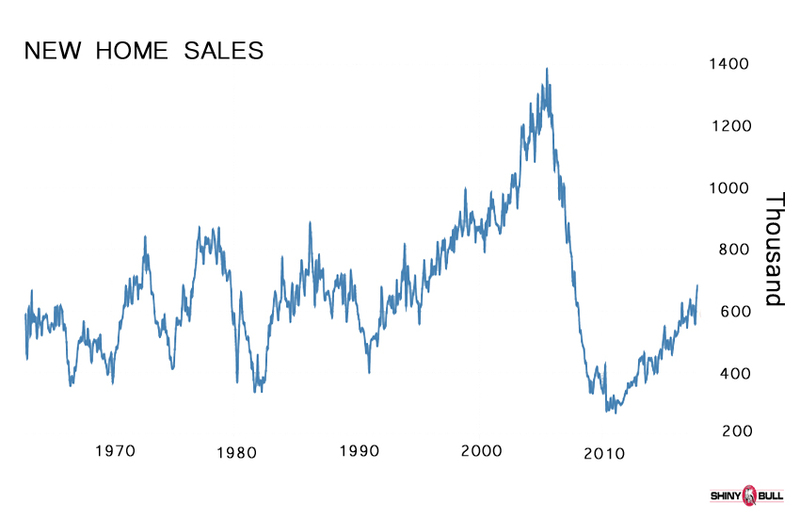 YoY, new home sales increased 17 percent. What`s going on here? The median sales price of new houses sold were $319,700 which is higher than last years $314,800. The average sales price was $385,200 which is higher than last years $366,100 in September of 2016. Sales rose the most in the South by 25,8 percent to 405 000. The West rose by 2,9 percent to 141 000. The Mideast rose by 10,6 percent to 73 000, and the Northeast rose by 33,3 percent to 48 000. YoY, new home sales increased by 17 percent, and the stock of new houses for sale was flat at 279 000, and this represents a supply of 5 months at the current sales rate. It`s a big jump thanks to Hurricane Harvey and Irma.